Fusion Racing was right behind the Dutch team, posting on their team page, “It was a great day out on the water with lots of lessons learnt and incredibly tight racing! 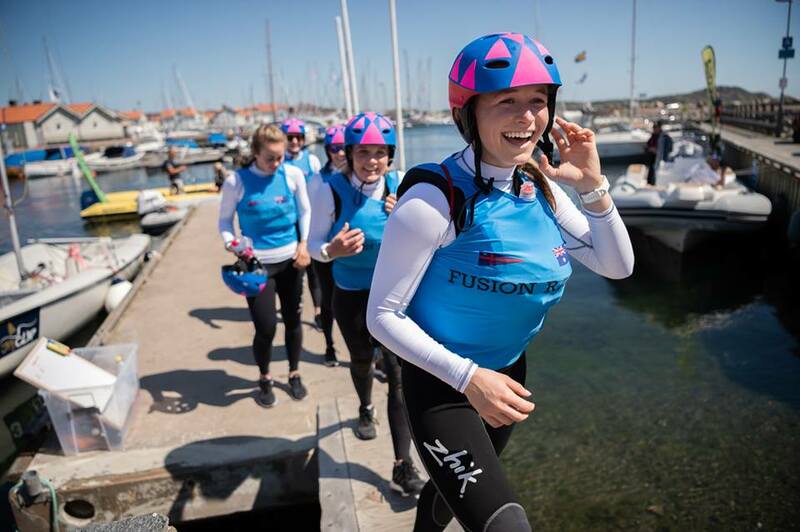 The Fusion Racing Team of Clare Costanzo (Skipper), Hannah Lanz (Bow), Jess Angus (Main Trimmer) and Ruby Scholten (Trimmer) were joined in Sweden by Charlotte Porter, who was part of the RNZYS Youth Training Programme in Auckland. Charlotte had had the opportunity to compete in youth match racing events including Harken, Musto, Hardy, Nespresso and Warren Jones, mainly as a trimmer. In 2017 Charlotte completed her first WIM event in South Korea as main trimmer for Sarah Parker (AUS). Before Sweden Charlotte was competing in Helsinki, Finland at the WIM series event- Helsinki Match Cup with the NZ Women's Match Race Team. The first day evening was rounded off with the official opening ceremony for GKSS Match Cup Sweden 2018 as all 17 teams were presented to the public and official guests and sponsors. On the second day (July 5th) the women’s fleet Qualifying Stage concluded with Sailing Team NZL skippered by Olivia Mackay on top spot, giving them the pick going forward to Saturday’s Semi Final Stage. Clare Costanzo’s crew were equal first, however ended up 2nd on countback. In their debut sailing in these boats the Fusion Racing team had excellent Qualifying rounds, placing 1st in two of the six races run. The overnight leader, Renee Groeneveld dropped a couple of scores in the two morning races on Thursday, putting her into the Sail-Off spot to face Portugal’s Mariana Lobato in the first knockout stage. The Dutch skipper, former Olympic match racer and Nacra sailor, showed her match racing prowess as she took a 2-0 lead. Lobato, also a former Olympic match racer from the London 2012 games, struck hard in the third to take a convincing lead. In the fourth and final match Groeneveld looked dangerous in the boat, won the start and led Lobato around the course. Pre-starts were the key to this pairing, with all four races being dictated by the four-minute pre-start sequence. Strong match racing manoeuvres, often not seen in the multihull era of WMRT, left the opposition high and dry in multiple cases. The women next raced in Friday’s Semi Final Stage with a slightly lower breeze of 6-8 knots forecast. On the day itself the commentators called the conditions ‘tricky’, explaining the course can have 8 knots of breeze at the top and go up to 16 knots at the bottom. New Zealand’s Olivia Mackay had made a surprise pick of opponent in Anna Östling, the most experienced M32 racer in the fleet. That left Clare Costanzo to battle Renee Groeneveld. Costanzo is skipper of the youngest team at the competition but flying as the highest ranked female team on the World Sailing Open Match Race Rankings. Renee Groeneveld with her experience as an Olympic match racer and former Nacra sailor and the experience gained through the extra ‘sail-off’ races, had an edge going into the semis. Renée Groeneveld won a straight 3-0 victory, qualifying as the first finalist for GKSS Women's Trophy. A great result for Dutch Match Racing Team. The Fusion Racing Team also raced well and gained valuable experience in these boats, even recovering from a capsize at the end of the third race. They now move on the America for the Governor’s Cup hosted by the Balboa Yacht Club in Newport Beach(International Youth Match Racing Championship. 16 – 21 July 2018), hopefully getting a small break to recover from travelling and competing. Harry Price, team Downunder Sailing, also was knocked out in the Semis, with British team GAC Pindar, skipper Ian Williams, considered the most successful skipper on the World Match Racing Tour after winning 6 World Championship titles in his career, the first to secure place in Open Final with another 3-0 over. The NZL Sailing Team members Alexandra Maloney and Molly Meech (Kiel 2018 winners in the 49erFX) Olivia Mackay, along with two-time Olympic medallist Jo Aleh and London Olympian Jenna Hansen also went 3-0 down to the Swedish Team Anna, skippered by Anna Östling, which means it will be a Dutch -Sweden dual for Finals and an Australian - New Zealand face-off for the Petit Finals.